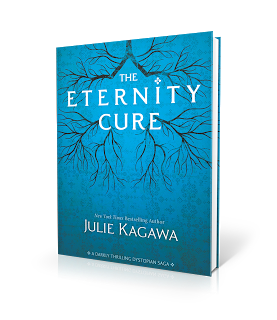 ILoveTeenBooks is a part of The Eternity Cure tour! The theme of the tour is Vampire vs. Human. On which side are you? Please visit the newly launched site Blood of Eden for more information. We will be discussing is our 'dear and sweet' Jackal. Yes! We got the coolest guy in the book! Hah! But before you read that, here's something more about The Eternity Cure. You won’t want to miss book 2 in Julie Kagawa’s dystopian masterpiece, Blood of Eden, optioned for a movie by Palomar Pictures.How do you face the end of eternity? 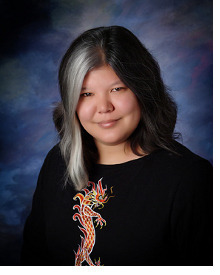 In Allison Sekemoto’s world, there is one rule left: Blood calls to blood.She has done the unthinkable: died so that she might continue to live. Cast out of Eden and separated from the boy she dared to love, Allie will follow the call of blood to save her creator, Kanin, from the psychotic vampire Sarren. But when the trail leads to Allie’s birthplace in New Covington, what Allie finds there will change the world forever-and possibly end human and vampire existence. As you can tell, Jackal is a really awesome, vampire(which one isn't? ), former vampire King of Chicago and Allison's older brother. Kanin turned him a couple of decades before finding Allie. Most think he is the villain in these novels but I think he is misunderstood. He is one of those anti-heros. You never know if he is telling the truth or not. He plays by his own rules and knows when is the time to strike and when to pull back. Jackal's biggest concern is Jackal. He doesn't do anything if he doesn't help him in any way. I'm still not sure why he helped Allie track down Kanin who's being torture by the so-called Psycho Vamp, Saren. Jackal calls Kanin 'old man' and doesn't show he still cares for him but he still goes with Allie. So I would say, don't underestimate Jackal. He is not as vicious as he's trying to make us believe. What I like most about him is his sarcasm and fearlessness. He teases Allie and Zeke when they're having a tender moment. He doesn't tolerate stupidity well so he just kills everyone that's going on his nerves, that is, if he can. Leave it to him to make all of us laugh. The only thing that's bigger than his thirst for blood is thirst for power. There's nothing he wouldn't do to be able to rule. He's proven that when he a King of Chicago. His subjects were all ruthless killers who enjoyed watching humans fight rabids. Jackals's only weakness is he can't turn humans into vampires so his plans aren't going well, for now. But who knows, he might get his kingdom back in the third book. *whispers* I hope so. 1. One lucky winner will receive their choice of The Immortal Rules or The Eternity Cure! 2. 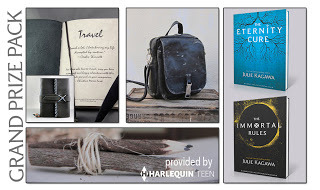 The second lucky winner will receive a Blood of Eden inspired Travel Package including: A beautiful handmade Leather Travel Journal, handmade pencils, a copy of The Immortal Rules and The Eternity Cure and a vintage Leather messenger bag “Alison Style”. Entries into the daily giveaway will also count toward the grand prize give-away! Don't Forget to Check Out the Other Posts on this Tour! Team Vampire (: Thank you for this amazing giveaway!! I have to go with Team Human! Definitely Team Vampire wit this series! I just think Kanin and even the awesomely creepy Sarren are just too intriguing! I'm also LOVING Jackal! Even though he's a mean SOB, he's also disturbingly amusing and kinda fun to be around. Team vamp, baby! Team Vampire. Thanks for the giveaway! Thanks for sharing and HAPPY BIRTHDAY AGAIIIINNN!